Bankruptcy Information | Can I Keep My Motorcycle if I File Bankruptcy? Can I Keep My Motorcycle if I File Bankruptcy? Home > Chapter 13 Bankruptcy > Can I Keep My Motorcycle if I File Bankruptcy? 15 Aug Can I Keep My Motorcycle if I File Bankruptcy? Filing bankruptcy doesn’t mean you have to give up your motorcycle, as long as the motorcycle payments would be considered a reasonable vehicle expense. Occasionally clients tell me something like, “I was told if I filed bankruptcy, I would not be able to keep my motorcycle.” This is one of the many bankruptcy myths out there, but it’s not true. So how do you know if your motorcycle will be considered a reasonable expense in your case? As I’ve stated before, the answer to most any bankruptcy question is: “It depends.” To understand what the answer depends on, let’s look at the two primary types of consumer bankruptcy: Chapter 7 and Chapter 13. With Chapter 7 (also called “straight bankruptcy”) there is no repayment plan for creditors. For secured debts (like mortgages and vehicle loans) the debtor either keeps paying the secured creditor or surrenders the collateral. The debtor lists his income and expenses in his bankruptcy. The purpose of listing income and expenses is to show that after deducting reasonable expenses, the debtor has no money with which to repay his creditors. If there is any significant money left over in the budget (more than about $100), the debtor will not qualify for Chapter 7. Instead, he will be required to file a Chapter 13 “payment plan” bankruptcy where creditors are repaid some or all of what they are owed. By way of example, if the Chapter 7 debtor has $3,000 per month in income, and $3000 in expenses, he has no money with which to repay his creditors in a Chapter 13. But remember, those $3000 in expenses must be reasonable. This is the key to the whole “can I keep my motorcycle” question. Let’s look at some hypothetical cases. This is obviously a very tight budget. It’s also reasonable. If we added in $200 as a motorcycle payment, it would serve no purpose. We can already see that the debtor has no money with which to fund a Chapter 13 plan. He’s also got no money to make a $200 motorcycle payment. But what if he wants to keep it? The bankruptcy system will not require him to give it up in this case. If he wants to spend less on food or give up his charitable donations or stop buying new clothes, he can do that. Chapter 7 is short-lived, lasting about four months from start to finish. If the debtor wants to make the payments, he can keep the motorcycle. But let’s be clear about this: keeping the motorcycle in this case would be a really bad financial decision. If we change the facts again and say the couple takes home $4000 per month and has the Chevy Malibu payment ($350), the motorcycle payment ($200), and a minivan payment ($350), can Harley Mama budget the motorcycle payment into the bankruptcy filing? No – not unless she gives up the minivan. Under those facts, the motorcycle is just a toy, since there are two other vehicles available to drive to work. If we tried to argue that the $200 expense for the motorcycle was allocated and could not be used to repay creditors in Chapter 13, we would lose this argument in most bankruptcy districts. 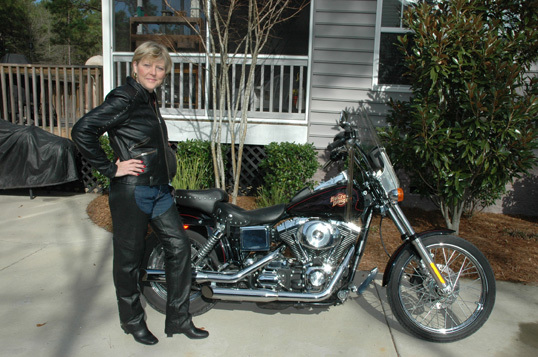 In fact, South Carolina’s owe Judge Helen Burris understandably refused to approve a debtor’s plan proposing to retain both a car and a Harley Davidson motorcycle in In re Allawas, slip. op. 07-06058-hb (Bankr. D.S.C. March 3, 2008). The same goes for Chapter 13, a payment plan bankruptcy. In Chapter 13, any vehicle payments allowed in the repayment plan take money away from what the unsecured creditors receive. So a big house payment, big car payments, and a motorcycle payment all reduce the money the trustee has available to repay other claims. In Chapter 13, therefore, the analysis is the same: is this a toy or a reasonable vehicle payment? In our last example above, we see the couple-two people-with three vehicle payments. In bankruptcy talk, three vehicle payments are not necessary for “the effective reorganization of the debtor.” The motorcycle is just a toy, and allowing the toy to be paid off in the plan reduces the amount the unsecured creditors receive. The easiest way to determine whether a motorcycle will be viewed as an allowable expense in Chapter 7 or Chapter 13 is to ask: is it a toy, or is it a reasonable vehicle expense.